“We will care for our patients as we would our family.” This motto is ingrained in each member of our staff. In our practice, we provide a respectful and caring environment in which the patient and the doctor can together treat any skin issues that may arise. Dr. Kien T. Tran, MD, PhD is trained as a Dermatologist and Dermatopathologist and treats patients of all ages, from infants to geriatric patients. His practice includes general dermatology, skin cancer surgery, and cosmetic dermatology. He received his medical training at the University of Pittsburgh School of Medicine and his specialty training at UT Southwestern Medical Center. Prior to becoming a dermatologist, Dr. Tran was involved in skin research at the University of Pittsburgh. Dr. Tran has been voted BEST DERMATOLOGIST in Rowlett and Rockwall by the readers of Living Magazine in 2013, 2014, 2015, and 2016 and has received numerous awards including the Patient’s Choice Award in 2013. Dr. Tran teaches medical students and dermatology residents. He serves as Clinical Assistant Professor of Dermatology at The University of Texas Southwestern Medical Center. Dr. Tran takes great joy in being a skin specialist and serving the skin care needs of the surrounding community. When he is not working, Dr. Tran enjoys time with his three sons and friends. In a poll of his children, he was voted “Best Father” by at least 2 out of his 3 kids. He hopes to eventually be voted “Best Dad” by 3 of the 3 kids. He calls the Dallas/Fort Worth Metroplex home and devotes his time with family, friends, and the community. He volunteers on occasion at Health Fairs in the Rowlett and Dallas area and is involved in the American Academy of Dermatology sponsored local skin cancer screenings. 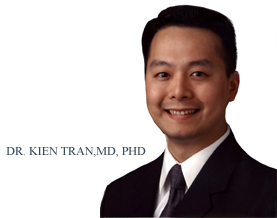 Dr. Tran has been active on a local, state, and national level with numerous medical and scientific organizations. He is a member of the American Academy of Dermatology, the American Medical Association, the American Society of Dermatologic Surgery, the Texas Medical Association, and the Texas Dermatologic Society. Kien T. Tran, Jane Grant-Kels, and Clay J. Cockerell. “Cutaneous Neoplastic Disorders in HIV and HPV Infected Patients and other viral related skin cancer issues.” Cancer of the Skin: 2nd Edition. Darrel Rigel, Editor. 2010. Kien T. Tran, Natalie A. Wright, Clay J. Cockerell. “Biopsy of the pigmented lesion-When and how.” Journal of the Americal Academy of Dermatology. 2008 Nov;59(5):852-71..
Kien T. Tran, Linda Griffith, and Alan Wells. “Extracellular matrix signaling through growth factor receptors during wound healing.” Wound Repair and Regeneration. 2004. Jun-July; 12(3): 262-268. Appointments usually available the SAME DAY or the NEXT FEW DAYS. Please call to schedule an appointment today. Dr. Tran serves Rowlett, Rockwall, Garland, Murphy, Wylie, Sachse, Sunnyvale, Fate, Heath, Dallas, Greenville, Forney, Richardson, Royse City, and the surrounding Dallas metroplex.